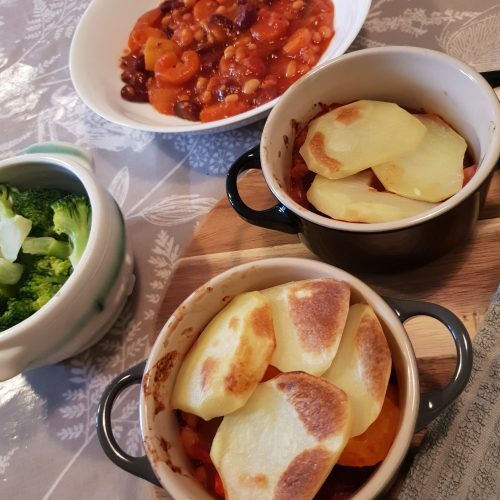 This hearty cowboy hotpot is great for those cold days when you want something warm and filling to eat. It’s perfect for the whole family and really easy to make. It’s packed full of healthy goodness with lots of veggies, I like to cut them big so that my 7 month old can pick them up easily and my fussy husband can pick the onions out of his. You can cut them smaller if you prefer though. You can make your cowboy hotpot as a big one pot meal or make individual portions, depending on how and when you want to serve it. I made one big hotpot and two little ones as Harry and Megan were eating earlier than Alistair and I. There was plenty left after feeding the four of us for mine and the children’s lunch the next day. Serves: A hungry family of 4. In a pan with a little cooking spray, brown the sausages. Add the red onion and peppers, cook for a further 5 minutes. Add the passata, beans, carrots (including the water from the tin), stock, herbs, mustard powder and paprika then stir well. Allow to simmer and reduce for approximately 15 minutes. While the mixture is cooking, peel and slice the potatoes into discs. This is also a good time to preheat the oven to 180°c. Boil the potatoes in a pan of water for approximately 10 minutes until soft. Drain the potatoes and allow to cool for a few moments so they are cool enough to handle. Lay the potato discs over the top of the mixture and spray with some more cooking spray. Cook in the oven for around 20 minutes, until the top is golden. Serve and enjoy! The cowboy hotpot will be piping hot so will need cooling for a while before giving to baby. I find it cools a lot faster if you cut up the sausage before cooling. 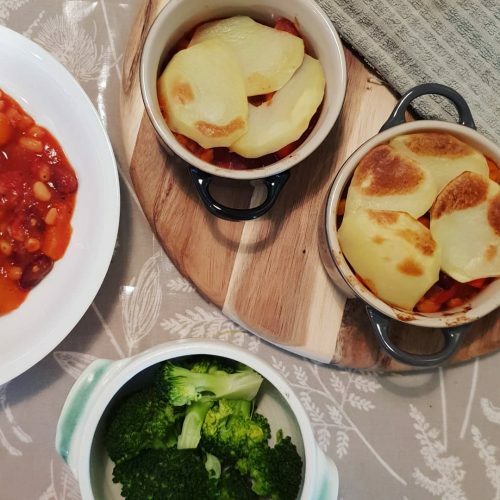 Tried one of our recipes and enjoyed it? Please share on Instagram and tag us here. We love to see your creations! Great recipe but I think there might be a typo? Should the second red onion in the ingredients read red pepper? Ooh yes!! Well spotted!! Sorry!